Cynthia Patricio is a mellow person who´s life is jammed packed with activities. 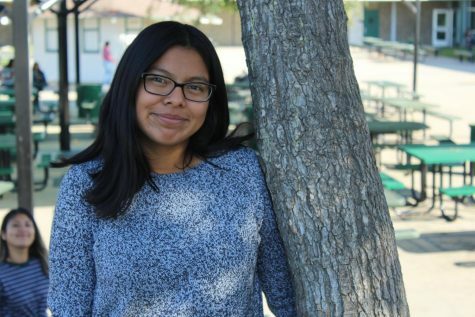 Cynthia is senior at Alisal High School who is currently planning out her future. She plans to apply to high prestige schools such as UC Berkeley, UCLA, and New York University were she will major in Chicano or Chicana studies. One of her many talents she´s acquired because of school is being able to create a 38 page essay in under an hour. During her years in school she got involved with band and played the flute for 4 years. Although she didn't do a sport during her high school years, she has maintained herself busy with her school work. Outside of school Cynthia is a part of an organization named Girls State. Girls State is a nationwide government training program. She was one of the many girls selected to be apart of this program. When she's not in this program she's at home studying, doing homework, or taking care of her brother and taking him to therapy. The majority of her time is dedicated to babysitting her 3 year old brother. Because of this, people assume that she´s teen a mom. In other words, Cynthia is a dedicated and determined student who will get her work done. She plans to get a job sometime soon on top of her studies. Although her everyday life is eventful she still finds time to enjoy Netflix. And just like the rest of us, Cynthia has her procrastination moments.